I love these quiltsw- the cat one is simpy perfect! Nie ma to jak kot na kocim quilcie ;) wie, gdzie najwygodniej. I dopiero teraz zauwazylam, ze mopsik przy psiej poduszce siedzi, haha. Tylko jamnik sie wylamal i przy poduszce z kotami sie polozyl. Koty w ogóle są cudownymi pomagaczami w szyciu! W każdej sytuacji, przy każdej maszynie a nawet szyciu ręcznym, przy wyborze szmatek, przy pruciu - we wszystkim są perfekcyjne!!! That grasshopper picture is very funny. Your cat looks like my cat, and the cat quilt is beautiful. Your dog knows how to enjoy a quilt and the pillow and dog are sweet. It looks like every species enjoys quilts. 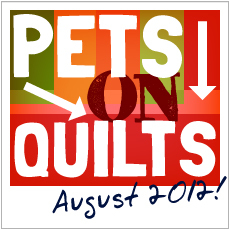 Thank you for joining our Pet Show - your pets are so cute, and quilts are wonderful! Love the cats on quilts. dogs? i guess they ok, too. MOL! I think the cat quilt is great. Wonderful cat quilt and very handsome dog pillow. My son loves bull dogs- they are his favorite breed of dog. 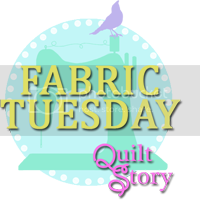 Thanks for sharing and participating in the blog hop. Your animals are such good helpers. Love the cat quilt! Wonderful pictures, all of the animals are so cute, thank you for sharing. Cute grasshopper and a gorgeous cat quilt. Thanks for sharing. Love the grasshopper! LOL. Such sweet pictures. I like your cat quilt! Beautiful! Love the photo with the grasshopper. Great post pictures, love the grasshopper one and the others are pretty darn cute too. Your pers are very cute. The grasshopper photo is unique. Love your cute pets and the grasshopper photo is amazing. The grasshoppers are impressed with your quilt. The pets are adorable too. I'm glad all your pets approve - including Mr. Grasshopper. very funny!